A set of 3 tapered/dinner candles made from 100% stearin wax (please read below for more information about this). 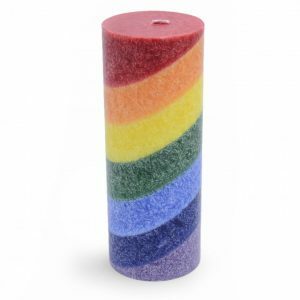 Size: Each candle measures approximately 22.8cm in length and 2.2cm in diameter. Burn Time: Approximately 8 hours. Information: Measures approximately 20cm in height and 7.5cm in diameter (8 x 3 inches) with a burning time of 70-75 Hours and weighs approximately 800 grams. It is unscented. 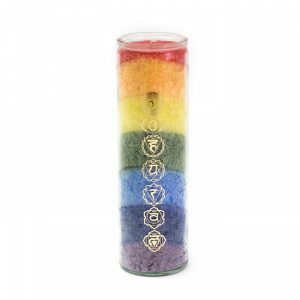 Each layer of the Candle represents of one 7 Chakras. 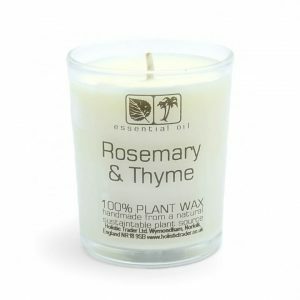 100% pure natural Palm Wax is made from fruit berries of the palm oil tree. This same high quality palm tree oil can be found in hand lotions, shampoos and cosmetics. It’s the purest non-GMO food quality wax. 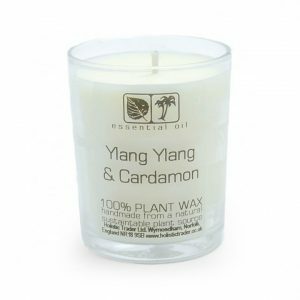 Palm Wax is made just like essential oils simply pressed and distilled. 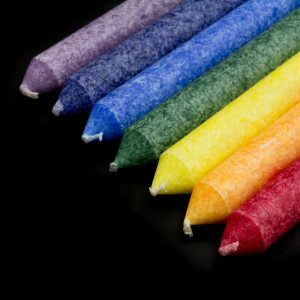 Soy and paraffin candles involve solvent extraction using petroleum chemicals like hexane. 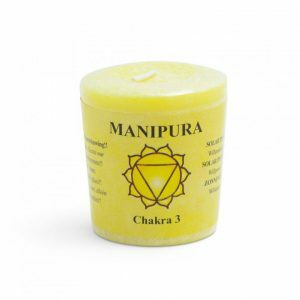 The candle measures approximately 4.5 x 4 cm (2 x 1.5 inch) and weighs approximately 60 grams. 100% pure natural Palm Wax is made from fruit berries of the palm oil tree. This same high quality palm tree oil can be found in hand lotions, shampoos and cosmetics. It’s the purest non-GMO food quality wax. Palm Wax is made just like essential oils simply pressed and distilled. 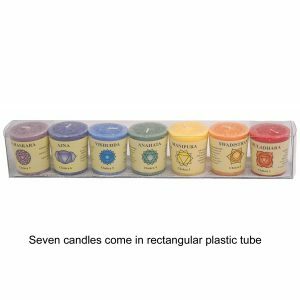 Soy and paraffin candles involve solvent extraction using petroleum chemicals like hexane. 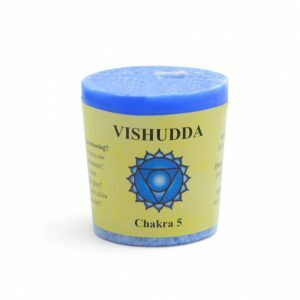 The candle measures approximately 4.5 x 4 cm (2 x 1.5 inch) and weighs approximately 60 grams. 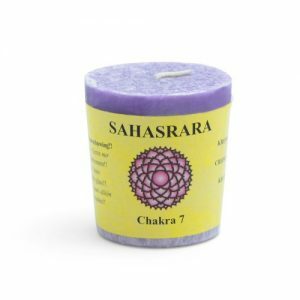 The candle measures approximately 4.5 x 4 cm (2 x 1.5 inch) and weighs approximately 60 grams. 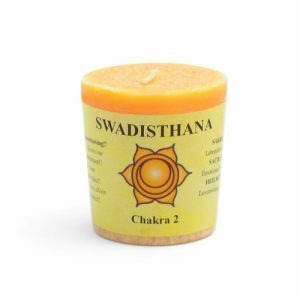 The candle measures approximately 4.5 x 4 cm (2 x 1.5 inch) and weighs approximately 60 grams. 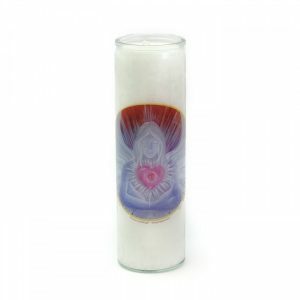 Information: This Angel Candle is held within a glass container, with an aroma of Incense and Myrrh. It measures approximately 19.5cm in height and 5cm in diameter with a burning time of 100 Hours and weighs approximately 800 grams (860 including packaging). 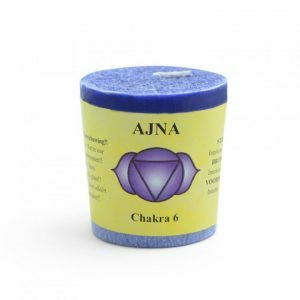 Chakra candle set dimensions: Each individual chakra candle about 4.5 cms (1.75 inches) tall. 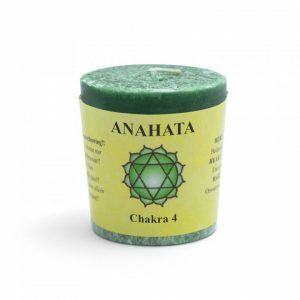 Chakra candle set made from pure plant wax with different natural essential oils. 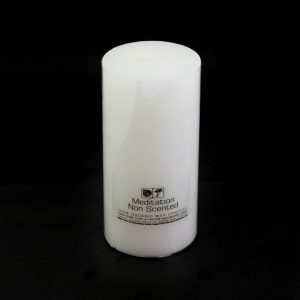 Dimensions: Diameter of non scented candle is about 7.5 cms diameter x 15 cms in height (3 x 6 inches). Burn time: About 100 hours. Weight: About 600 grams. 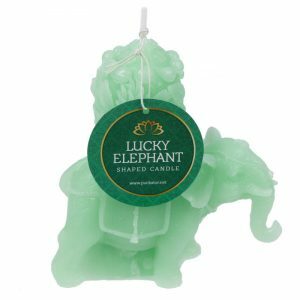 Ingredients: Contains natural clean burning plant wax. This is a high quality natural product. 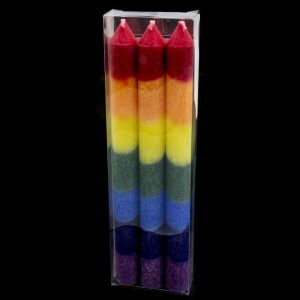 Environmental Information These candles are made from an organic plant wax (soya & palm wax), the wicks are made from cotton and are suitable for use for vegetarians. All waxes and oils are traceable from plantation to factory, the crops are not from deforested areas and the supplier of the materials is a member of Roundtable on Sustainable Palm Oil. These do not contain paraffin or petroleum products.